In Replenish, an experienced pastor sounds the alarm about dangers that threaten the soul of a leader, offering hope for a sustainable and enjoyable life. Every leader functions on two stages - the front stage or public world, and the back stage or private world. One cannot lead successfully front stage when one is completely depleted back stage. In a time when pastors are leaving the ministry in record numbers due to cynicism, disillusionment, weariness, and personal scandals, there is an urgent need for soul care in the private lives of leaders. Replenish helps leaders focus on the back stage, the interior life, in order to remain spiritually healthy. In a caring, encouraging tone, it will show pastors how to: prioritize matters of the soul; develop healthy spiritual practices; address problems that lead to burnout; create a healthy rhythm in their lives; improve their people skills and the spiritual climate of their team; develop better systems in their churches; and discover how to lead an unhurried life. 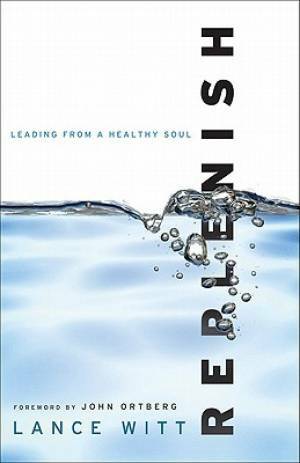 Replenish by Lance Witt was published by Baker in July 2011 and is our 17979th best seller. The ISBN for Replenish is 9780801013546. Be the first to review Replenish! Got a question? No problem! Just click here to ask us about Replenish.